The one I keep re-using was from near the end of my AC PF4 stash. Could your filter be cocked slightly? > Could the filter itself be suspect? > update again when i can try these suggestions. 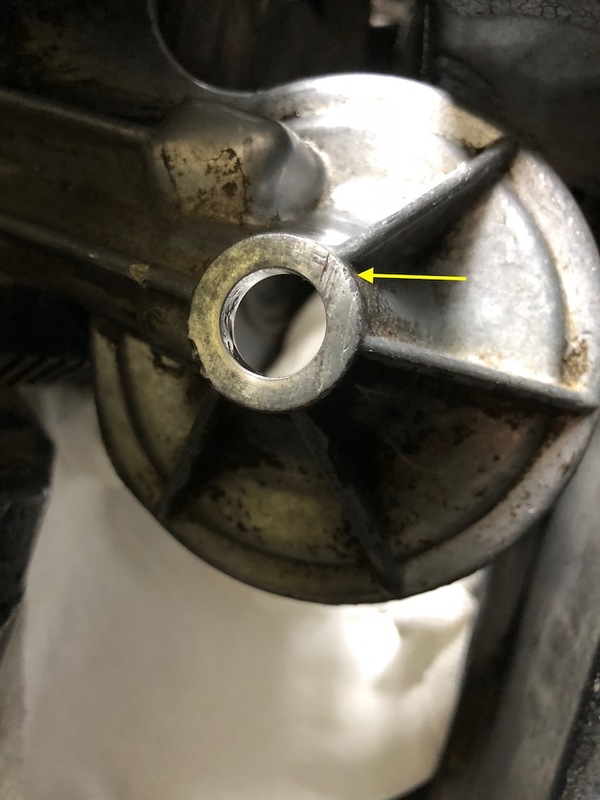 Your leak is between the bolt and the housing. Your filter is fine, . . . . UNLESS, there is more that you have not showed/told us. The top side at the bolt appears to be my only leak. I got shipment of new washers today from clarks. 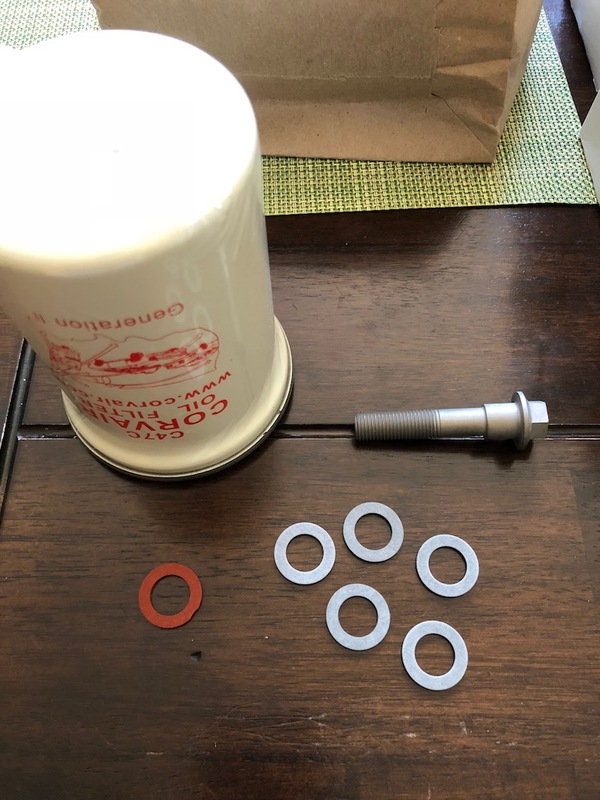 - if you order the gen2 filter, you get an orange-colored washer included. - if you order any extra washers separately, you get gray-colored ones. 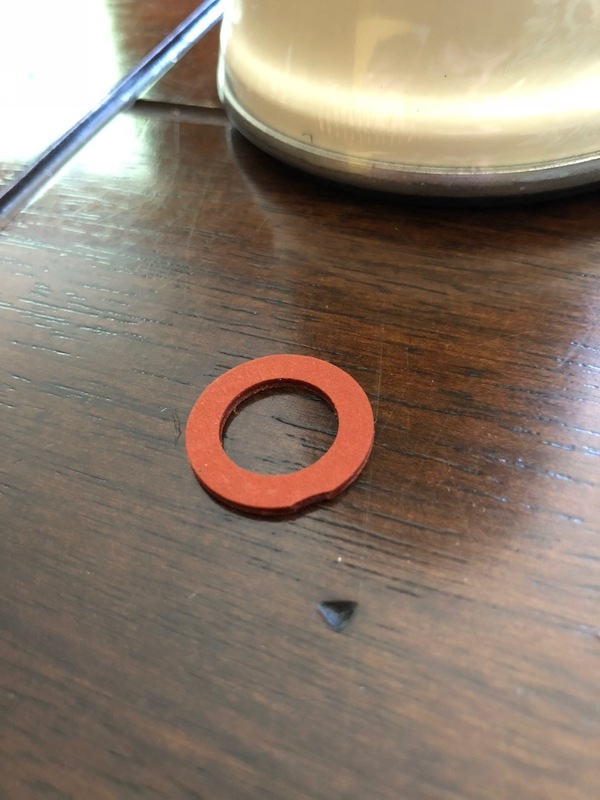 And -- this orange washer came with a bite taken out of it! The little bite is pretty common on many punched gaskets. It would be unlikely to affect sealing. Any bigger, though, and I wouldn't use it. If the underside of the bolt and the top of the housing is flat and burr free, that red washer will seal. I just removed the filter, and I see the top of the housing has some serious scratches in it -- The arrow in the photo is pointing the spot where it is leaking -- No idea how these scratches got there or if they have been there for a while -- but this is the first time i had leak issues with a filter change. A little careful work with a file should do the trick. i'm sure i don't have the right filing tool to best do this -- can anyone suggest a file/type and procedure? I don't want to guess and totally screw this up. I would probably try some lapping compound under the head of the bolt. Work it back and forth, remove clean inspect. If not correct, repeat until it is. I think the one scratch that is the problem is too deep for lapping compound. You could fill the scratch with some epoxy or JB Weld. i have JB Weld Steel stick on hand, would that work? I don't see why not. Just make it nice and smooth. I would put a layer on and then scrape it off with something like a credit card. Then it will just be in the grooves. Yeah, go with the coarse stuff if you have a choice. The plus with lapping is you will also true the aluminum surface to the bolt. I think it will cut pretty fast, only go 30 seconds at a time then check. I don't think it needs to be perfect all the to the perimeter, just so most of it is clean a smooth. If you aren't making progress then try JB weld. OK - that makes sense -- i bet those scratches were at least somewhat already there and it was holding until this last change--- odd direction of scratches -- like somebody was doing something else with the bolt off... i have never had the bolt off for more than a few minutes at time, only while changing the filter. May have been that way for a while and was filled with crud, or maybe JB weld or something. The last time what it just stuck to the gasket instead of the aluminum. Sure looks like a crack in the raised nub just above the bolt hole in your picture. Yes, that is a crack. Dangit. I didnt notice that before, but i am wondering if it could be a surface crack? There are other dings in the top of this housing in addition to the dings at the bolt hole that I am already working on. I haven’t seen leaks where that crack line is. What happens if it turns out to be worse? Now i am a little nervous. If it is a crack it will probably begin to propagate, it probably could be repaired by having it TIG welded. If it was mine, I'd get another adapter, It looks like it is a EM mount in your picture, are you running a generator? If so, PM me I will send you one for the price of shipping. If it you have an alternator, I do not have extra of those.